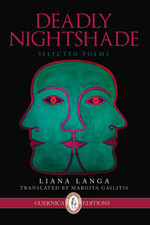 This upcoming Saturday, April 18th, Liana Langa will be in Toronto promoting her new poetry collection Deadly Nightshade along with translator Margita Gailitis. The event will take place at the Black Cat Espresso Bar (1104 College Street) at 7 PM. The evening will start with readings by Liana and Margita and will be followed by any responses from the audience— spoken, sung or otherwise. Deadly Nighshade will be published by Guernica Editions in Fall 2015. The poems in the collection raise the classic existential issues of the intensity and diversity of life, the daily presence of death, unavoidable loneliness, the materialism of the era, man’s moral obligations and the defence of humanism. Liana Langa displays above all a personal stoicism and the poetical ‘I’ stance accepting of the humanism criteria of individual perseverance, of survival and obstinacy, precisely that which shapes the cultural values of an individual set against an oft-dehumanized and mediocre environment and the limitations and single mindedness of a consumption oriented society. Her acceptance of the utmost importance of moral values and the defence thereof through the lyrical ‘I’ is one of the most characteristic sources of Langa’s poetic inspiration. Latvian author Liana Langa is the author of four books of poetry and one of prose: Deadly Nightshade (2010), Diary of Aerials (2006), Blow Your Trumpet, Scorpion! (2001), Now the Sky, Now the Hourhand (1997) and the collection of travel essays I Did Not Have To Hurry (2008). Langa is the recipient of the Latvian Poetry Day Award (1998 and 2006) and the Annual Award in Literature (2001 and 2011). Born in Riga, Latvia, poet and translator Margita Gailitis immigrated to Canada as a child. Gailitis returned to Riga in 1998 to work at the Translation and Terminology Center as part of a Canadian International Development Agency initiative. Today Gailitis focuses her energy on literary translation and poetry, having translated some of Latvia’s finest poetry, prose and dramaturgy. Gailitis’ own poetry has been widely published and has won her awards from both the Canada Council for the Arts and the Ontario Arts Council. Tagged with Deadly Nightshade, Liana Langa, Margita Gailitis, Poetry, reading.